When in Switzerland, my day begins with cheese; a trail lunch will be either cheese and crackers or a stop at a chalet for some fondue. During this last trip, I became attuned to the nuances in flavor, even within the same appellation d’origine contrôlée (AOC). How does cheese get its taste? 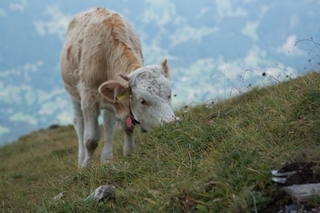 My investigation began during a rainy day visit to La Maison du Gruyère My favorite part was sniffing the various alpine plants which alpine cows eat. Another flavor-maker is unpasteurized milk. In the U.S., we kill organisms and destroy helpful proteins eduring pasteurization and then have to add cultures back in. What is present naturally in milk is a much more complex flora than the mix used by U.S. producers. rennet (this is a crazy ingredient – when they slaughter an unweaned calf for veal, they save the fourth stomach chamber and then dry, clean and slice it into small pieces with salt water, vinegar or whey to reduce the pH. They filter it and the liquid they take off of it contains a mix of enzymes which coagulate the milk. It makes me wonder: how did they figure this out? – ‘hey Marge! maybe we should toss some of this stomach in to the cheese mix…’?). Each one of those agents holds a universe of possibilities for flavor tweaks. Scientists have a general understanding of the aging process. For these longer-aged cheeses, the bacteria present in the starter inhibit the growth of harmful organisms. These bacteria also die off. And when bacteria cells die their cell walls fall apart and release enzymes which are now free to break down the fats and proteins within the cheese. With some cheeses these changes promote the growth of a different set of organisms which add their own waste products which manifest as holes, flavors, rinds, etc. The biochemical details of these processes are not entirely worked out. I used to have a sourdough starter that I called, “The Beast.” The more I read about cheese, the more I see its production as a whole community of Beasts, the populations of which the cheese-maker tends and nurtures. If cheese from The Bernese Oberland has holes, they don’t sell it. Cheese from the warmer region of Emmental, however, does have holes. Three different bacteria inhabit Emmentaler cheese: Streptococcus thermophillus, Lactobacillus and Propionibacterium freudenreichii. Though their names sound scary, the first two bacteria are familiar – they are both part of the “live cultures” in yogurt. They create lactic acid which is in turn eaten by that last bacteria, which people call “prop” for short. And when “prop” uses lactic acid, it releases CO2 which makes the holes (bubbles) in the cheese. Cool, huh? Finding #5 They’re still discovering about cheese. For example, an article published in January 1996 in the International Journal of Systematic Bacteriology describes the discovery of 2 new bacteria that they found on the surface of Gruyére and Beaufort cheeses. (2) Considering the brining that happens during the aging process of Gruyeres, I wasn’t too surprised to find out that these two species are highly salt tolerant. They’d have to be. That was when I really started to appreciate the complexity of organisms living in cheese. And I hadn’t even gotten to the molds yet. Finding #6. The white “bloom” on French cheeses such as Camembert and Brie comes from a mold Peniccillium camemberti. Finding #7. Raclette requires a yeast for its flavor Yarrowia lipolytica. This yeast is very different from the yeast of brewing, etc. First of all, to live, this yeast requires oxygen (bread and beer yeast can use either O2 or CO2); but what’s really cool is that this yeast can actually use normal hydrocarbons and various fats as carbon sources. When I read that, I immediately thought: bioremediation? and yes – they are currently developing this organism for use in a wide variety of products and technologies. That’s probably enough nerdy stuff on cheese for one day. I still have about 0.5 kg of Raclette left from the trip. Now would be a great time for a snack. (1) Sehovic, J. (1988) “Secondary metabolites in some plants of grassland forages.” Rech. Agron. Suisse. 27: 153-165. Sehovic J. (1991) “Consideration on the chemical composition in the quality estimation of the natural grassland forages.” Rev. Suisse Agric. 23: 305-310. (2) Schubert, K. et al. (1996) “Two coryneform bacteria isolated from the surface of French Gruyère and Beaufort cheeses are new species of the genus Brachybacterium: Brachybacterium alimentarium sp. nov. and Brachybacterium tyrofermentans sp. nov.” Int J Syst Bacteriol. 46 (1): 81-7.